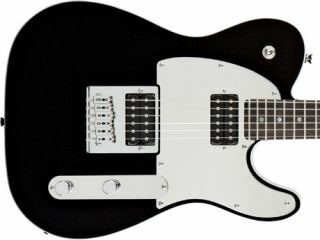 Following the success of his full-blown Fender signature Telecasters, the latest model to bear solo artist, Rob Zombie and former Marilyn Manson guitarist John 5's name is an even more affordable proposition in the shape of the Squier J5 Telecaster. Retailing at £379.99 in the UK, the J5 features familiar black and chrome cosmetics, a polished stainless steel scratchplate and a dual volume control setup that allows the pickup selector to be used as a killswitch. Nice. Check out Total Guitar magazine's November issue, onsale 5 October, to read a head-to-head review of the new Squier J5 up against Jackson's Mark Morton Dominion D2, the BC Rich Kerry King Beast V and the Washburn N1 Relic.